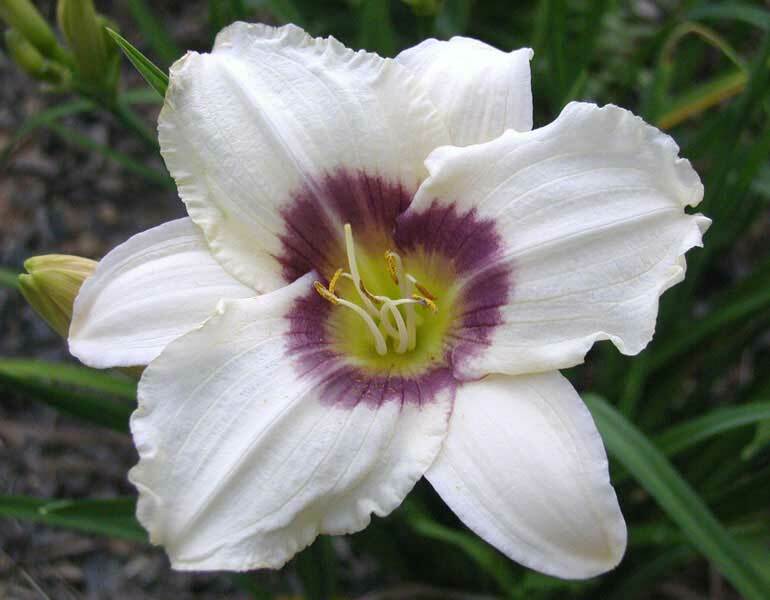 One of our most popular varieties features pale cream blooms with a deep purple eye. Short scapes make a good choice for the front of the bed or border. 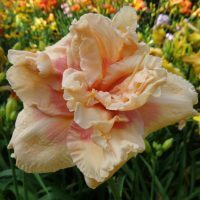 This daylily has exceeded all my expectations. 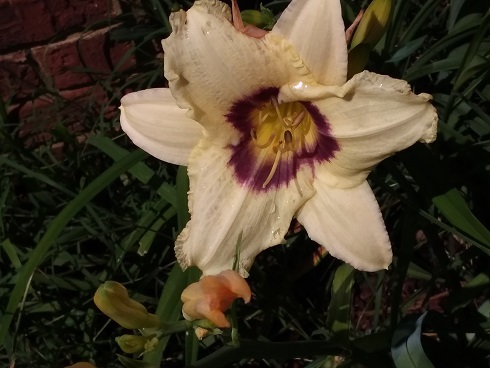 It’s grown so quickly and bloomed so prolifically this summer it outdid every other daylily I own. Attractive, fragrant, a treasure! My Pandora’s box doesn’t show until late int he season (northwest NC) and it is very pretty if in the midst of purple and white. It is isn’t a “big” but it presents well. It doesn’t have lots of stems at our house but we enjoy them while we can. I probably will move mine next year to get the dark beauty of Night Wings or Jungle Beauty or Dominic. I think it will look better surrounded by there. But is is lovely. I think I don’t have it in the right place. Blooms galore. It might be small but what a show off!! 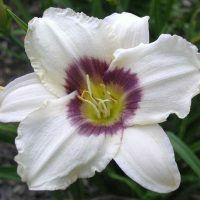 This daylily is not as pretty as my other daylilies. I planted it last Fall and I am not impressed. I love Pandora’s Box. I left it at my last home and planted it again here. I now need to move it, because a tree has grown enough to put it in shade, but PB just keeps blooming! Hardy in my WI garden, no problem! 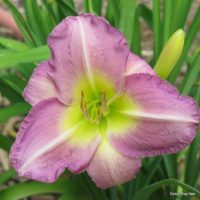 Pandora’s Box has been planted for almost 2 years now, and it has been the best performing daylily I have, especially for the price. Multiple scapes and countless buds cover it with very nice flowing foliage. I should be able to divide it into about 4 nice clumps in the fall. You won’t be disappointed with this one! Hardy bloomer & I like the contrast of light petals with the dark center but much more yellow than cream or white here in SE Texas. It is very pretty with my purple groundcover. 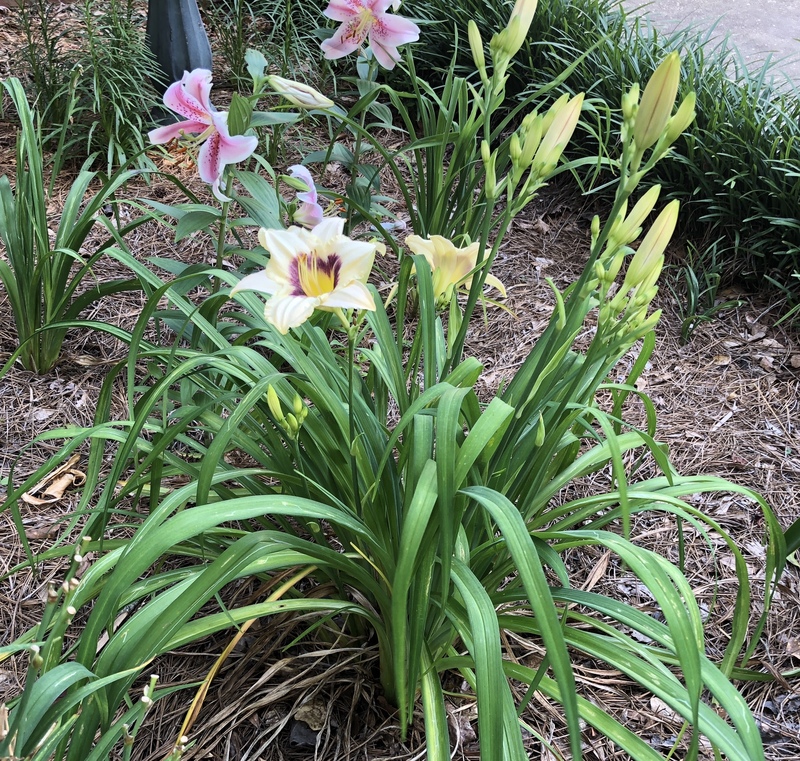 I planted this day lily several years ago in my “Hell strip,” the area up against the street, and it’s thriving. It’s healthy and huge, and bloom prolifically. I planted Pandora’s Box from you last year. It bloomed last year but this year, I was just amazed at how beautiful this flower is. Hard to do it justice in a photo. The lighter part is more of a cream color and the dark is a red-purple. Truly a beautiful plant! I planted this one in early June of 2014-no blooms. A few flowers in summer 2015 with most of them barely rising above the foliage. 2016-WOW!! Profuse blooming and flowers well above the foliage. Gorgeous! This day in time you just don’t get what you pay for. But, as always, when I opened the box I had HUGE fans of each variety. It is like getting triple for your money! Not the shriveled up , nearly dead pack of mostly sawdust that you get at the ‘discount’ store. Those ones never perform. 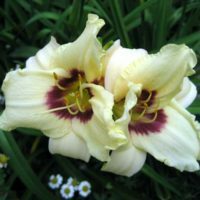 But Oakes plants are very hardy, huge & thrive year after year. Of course, we all have our favorites based on our personal preferences, but I originally received Pandora’s box as a free-bie & when it opened up I was in love! It is simply charming. I used to be an over-the-top big bright blooms girl. And I still have a bunch in the garden. But I now find myself anxiously awaiting the delicate smaller bloomers. I have the worst soil; but this one, as well as the others from Oakes, continue to come back bigger & better every year. I ordered several PBs late last year, and have enjoyed their 1st bloom! The PBs are in full sun, and if you look at the different pictures on this page, are decidedly on the cream vs. white side of the color equation (almost like “Siloam Button Box”). 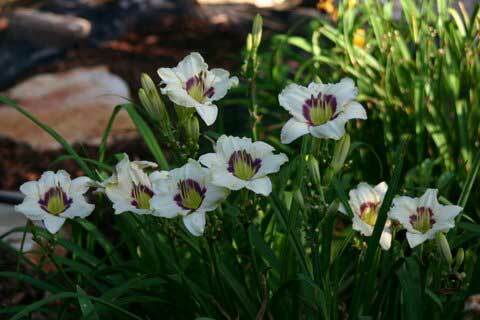 The flowers have tended to be > 4″ on very short scapes, some of which don’t even “escape” the foliage. 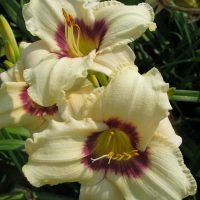 I would not consider these showy, in your face daylilies, but more subtle, front of the border or pathway beauties inviting you to pause and enjoy the presentation of flowers and foliage together. Thank you Oakes! I call Pandora’s Box “the poor man’s Wild Horses”. 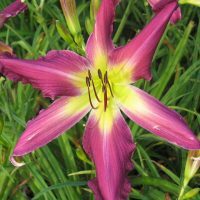 Similar in appearance, a bit smaller and less dramatic, but with an unmatched bud-count you won’t feel like you’re missing anything when this daylily starts its display. It just keeps going and going! 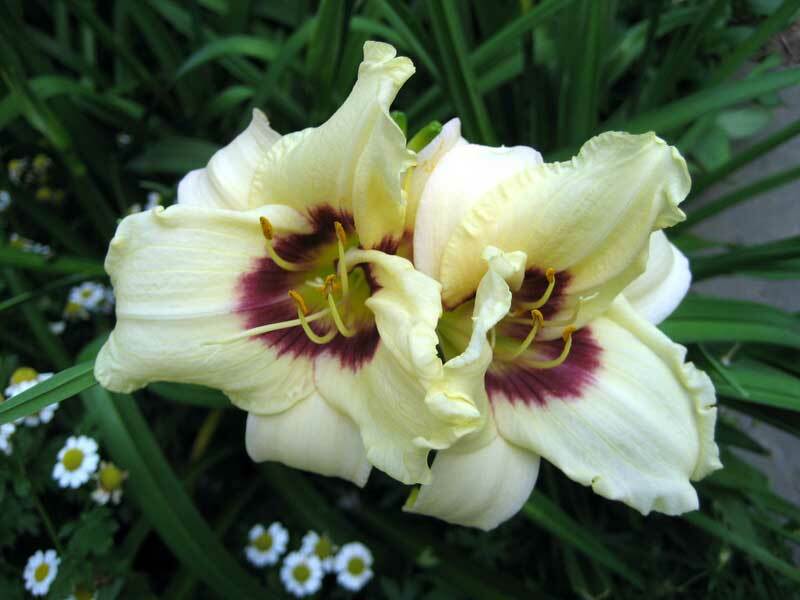 One of my favourites but always blooms a pale yellow with vivid purple eye. Easy to transplant to other locations if wanted. My old complaint is that it has a tendency to loose it blooms down with in the foliage. 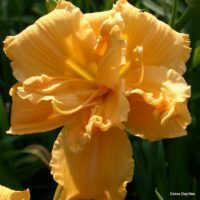 This was the daylily that started my obsession! I started with one and 10years later I have 15 AND I have probably given away three times as many. It is very fragrant. The first time I smelled it I thought it was my oriental lilies. 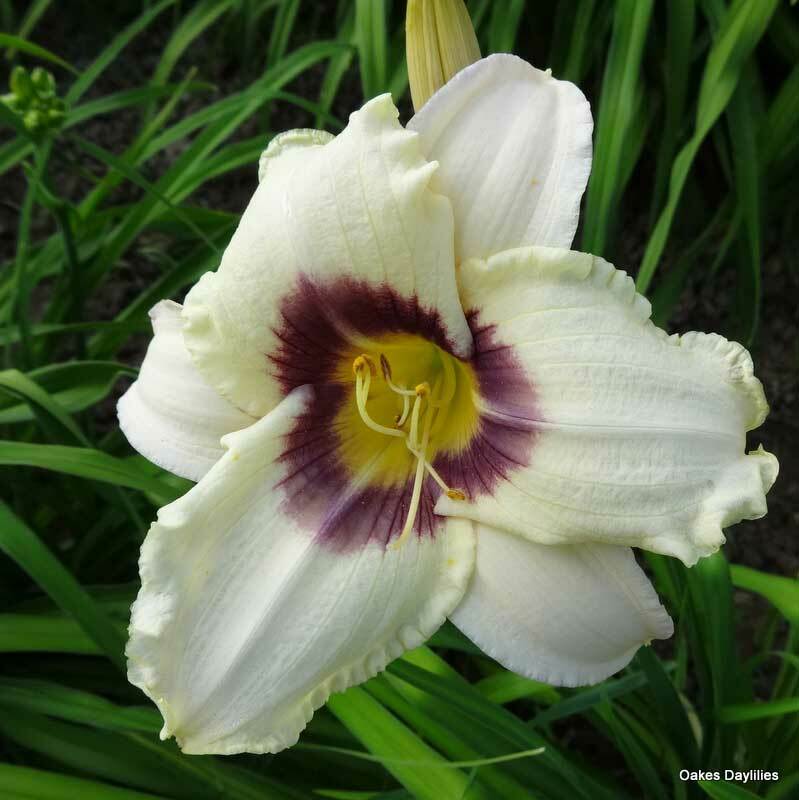 The color is a darker cream with a dark center in my garden. I live in zone 5/6…we do get harsh winter weather but I never have a problem. Planted 3 of the Pandora’s Box this spring and they have not bloomed at all! Actively growing, but no scapes and no blooms. Extremely disappointed that it has not bloomed. 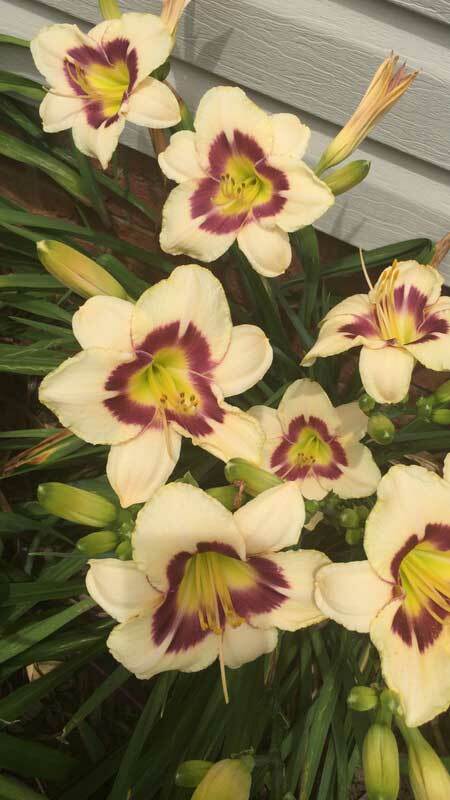 This little daylily is well worth adding to your garden. The color is soft with the eyezone adding an extra feature. just love everything about it recieved it as a gift in my order and its doing great it seems to tolerate hot tropical conditions if its put on some shade really love it and happy with it. Great little performer! This little beauty has been in the ground less than 2 weeks and it is already sending up 1 scape! I can hardly wait for it to bloom. Did I mention the generous plants you receive from Oakes? I can hardly wait for next year. Gave this one a “10” because in my estimation it is worth every bit of it. I am hooked for sure. If you are on the fence about this one, I would suggest you take the leap. You will not disappointed. 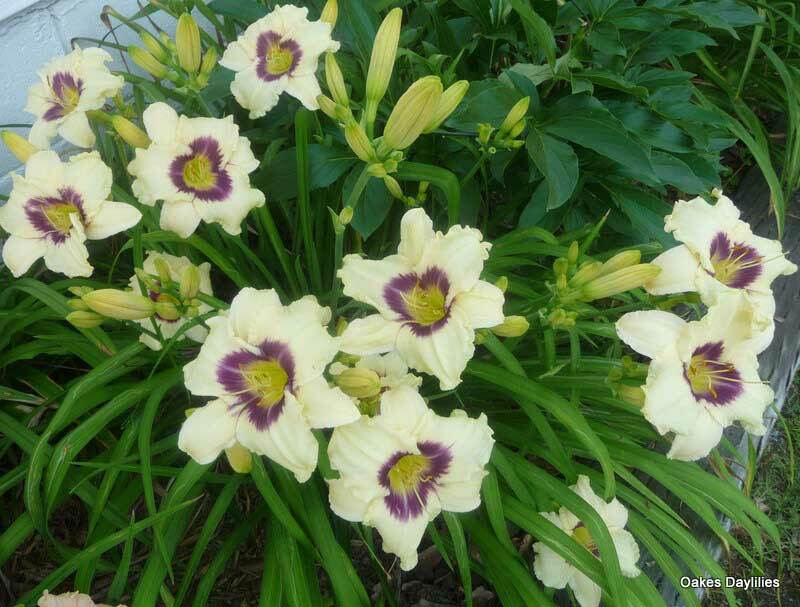 Very prolific daylily, tons of flowers, gave it only 8 stars because they are not light cream in my yard they are a creamy yellow with a darker than shown eye. However have already divided them. I got this one this past year. The clump was so large the a section fell of (about 3 fans) I planted it on each side of a path at one of the garden entrances. The larger clump bloomed twice and the small clump bloomed by the end of the summer. The second flush on the larger clump had thrown up about 5 scapes. The flowers here in the north were more of the cream color with the purple/burgundy eye zone. A beautiful flowere and great performer. Looking forward to this summer. It is a 10. Beautiful. Grows great in my garden. Brighter than the photo shows. Nice and compact. Love it. This little one is very pretty. It looks just like the picture. It’s not one of my favorites because I like a more bold color, but lovely nonetheless. These little ones bloom their hearts out from May through early July (zone 8b). Provide them with some shade in the afternoon, and they retain their beautiful coloring on into the evening hours. A nice surprise, this growing season, was the appearance of proliferations on their scapes! I’ve had this jewel in my garden over 6 years. It never ceases to make me smile. I’ve gotten rebloom and occasionaly a blossom that appears double. It’s a charmer for sure! This is such a cheery little plant. Mine just blooms it’s little heart out. Sometimes the blooms are a bit darkier but for the most part they are just like the photos. Lovely, profuse bloomer. The blossoms are larger than I expected. Love this lily! Blooming already and just planted this spring! 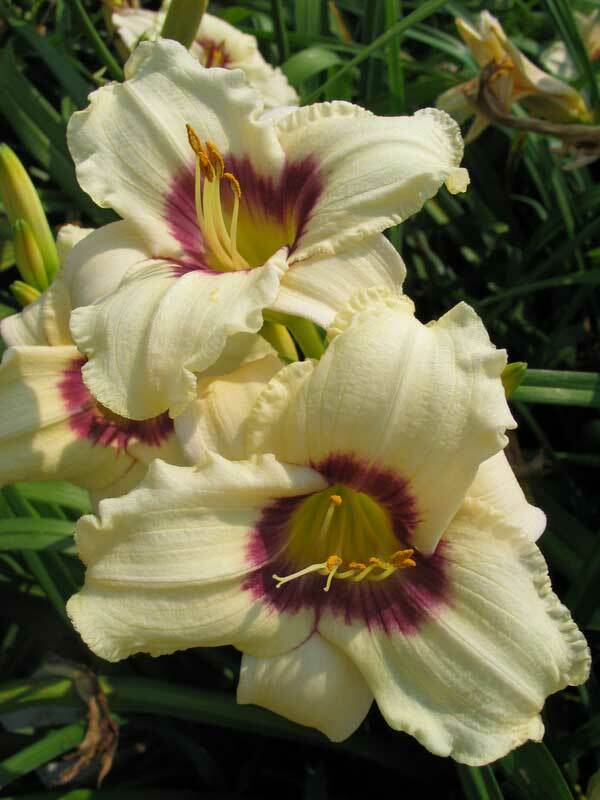 Cute and perky, a light creamy white with a paler eyezone than in the pictures, but still stunning! I planted Panodora’s Box last year right before the drought. I gave it no water, no special attention what so ever. Further, I was greedy and took the large plant I received as a gift and divided it into four plants! 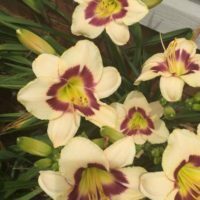 It has rewarded me this year with four med-to-large lush plants with prolific blooms! This past week daily I have counted over 16 blooms each day! Just planted this in April, and it already bloomed (quite profusely) on June 1st. The color exactly matches the photo, but the shape does not. The inner petals curl so much it almost appears as if they have 7 or 8 petals altogether. Very beautiful nevertheless. This plant is in full, scorching Texas sun and looks outstanding all day. This is the second year for Pandora’s box in my garden,they are blooming well and look just like the picture. The yard men cut them down several times before I put a cage around them. They came back and are blooming here in Texas in late May. I have them planted with Yellow Lollipop and the contrast is nice. Very short bloom season and unimpressive. In all fairness, they may have done better if planted on the west side rather than the east. This is their 2nd year in my garden, and it’s gorgeous interspersed with Little Grapette. They are my husband’s favorite it the whole garden! I have Pandora’s Box planted in conjunction with Pardon Me in my serpentine back border. WOW, what a show they put on! My Pandora’s Box has more of a creamy peach color than the picture; and it is just yummy. It is VERY PROLIFIC! The combination of these two is a show-stopper. 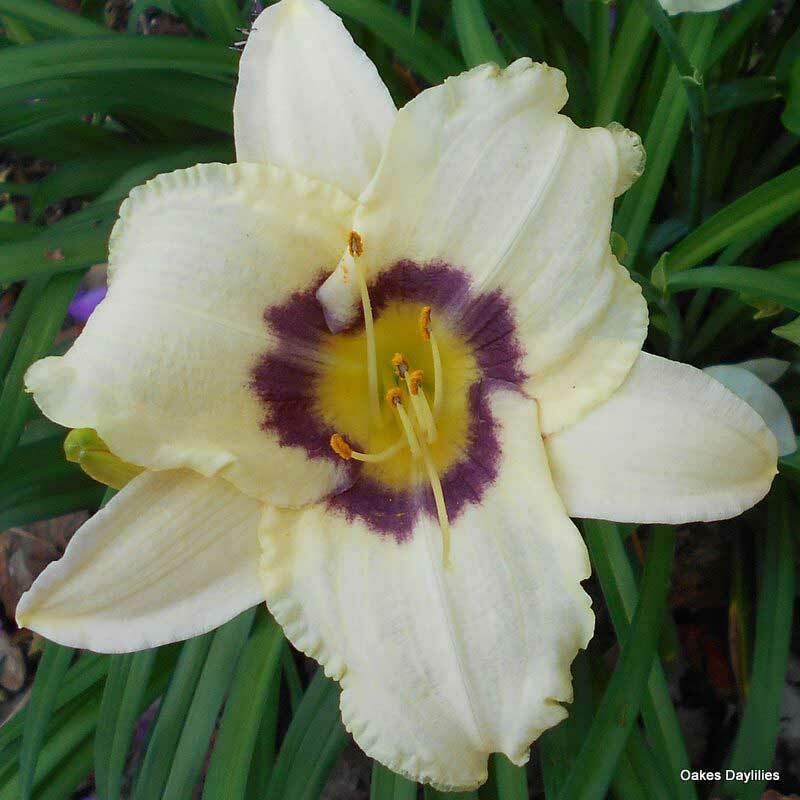 These are very pretty – the color is slightly more pale yellow than pictured above and the eyezone is a wonderful, cool purple. 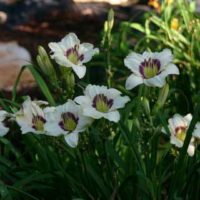 They are very eye-catching especially since they have to endure a spot that has a lot of morning shade. They are absolutely loaded with blooms and it looks like we will be getting some good rebloom in year #3. I love this lily! It had a long bloom period, and I was sorry when it ended. I’m looking forward to some rebloom later on. It is a beautiful gem to brighten up any garden. As others have suggested, Pandora’s Box really pops when planted next to purples. 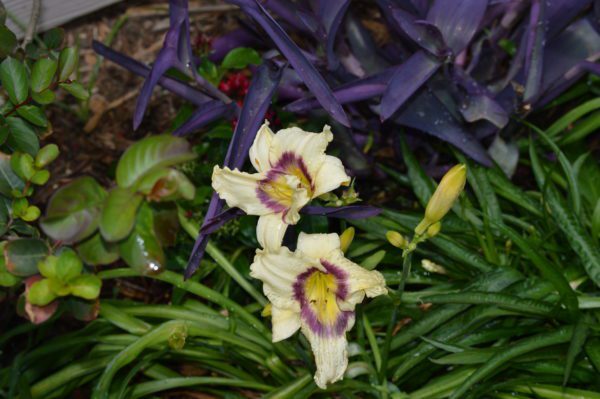 In my garden Pandora’s Box and Remus daylilies bloom in tandem. My free Pandoras opened today (July 7th) and are beautiful. I have them located next to some Appleblossom Carpet Roses which makes them look a bit yellowy-peachy. I think next year I willmove them over by my purple and mauve plants. They are petite plants with nice size blooms. Thanks for sending them — the free plants are always the most fun! Short, very dramatic contrast of a lime green throat with purple eyezone. One of my favorites. Plant this guy at the feet of Mr. President clematis — the deep purple clematis sets off the purple eyezone of the daylily for a real WOW.